Kirk Bell November 30, 2018 Comment Now! Turn 16 at Atlanta Motorsports Park is a test of a driver’s courage and a car’s ability to stick to the track. Though it’s only a slight right-hander, it follows the turns 13, 14, and 15 left-handers that link to create one big, high-speed arc. Turn 16 is the moment of truth when the weight shifts from the right side of the car to the left, at a speed as high as the car can handle and the driver will dare. 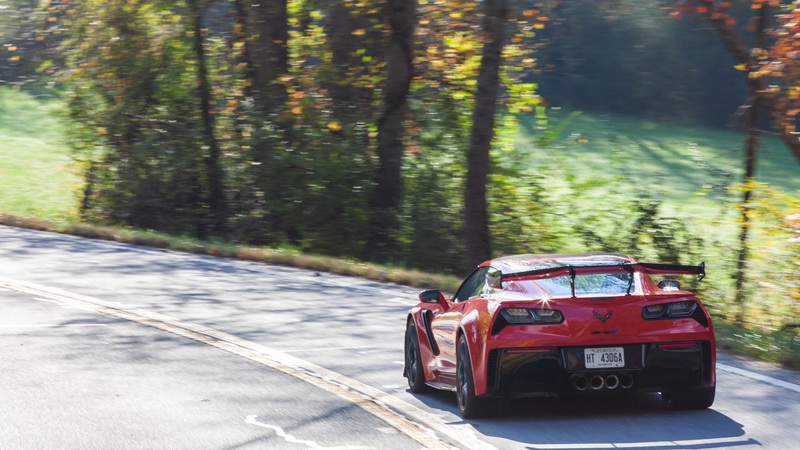 It’s a turn made for the 2019 Chevrolet Corvette ZR1. Stability, grip, and aerodynamics are the keys to turn 16, and the ZR1 has them all in spades. Stability and aero play together. A planted chassis keeps the car under control during that weight transition, and aerodynamic downforce pushes the car into the track. The ZR1’s low-slung ride height and high wing from the ZTK Track Performance Package conspire to create rock-steady stability. That rear wing can generate up to 950 pounds of downforce—an Arabian horse or a grand piano back there going along for the ride. An upside-down wing under the front end balances the downforce from the rear, and together their effect means the stability actually builds as speed rises. The final key to making it through that turn without sliding out wide is the ZTK package’s set of Michelin Pilot Sport Cup 2 tires. The best thing next to slicks, the 285 mm front and 335 mm rear rubber sticks to the track, keeps sending the ZR1 forward instead of sideways, and hooks up for the last blast—the highest speed on the track—into turn 1. The ZR1’s behavior in low-speed corners is just as accomplished. The manhole cover-sized carbon ceramic brakes arrest speed with authority as the car scrubs off about 100 mph to make the sharp turn 1 left-hander. Again, it’s rock steady. No wobble, no dive. Just poise. Running in Sport mode, the steering is like Roseanne Barr: weighty and direct. 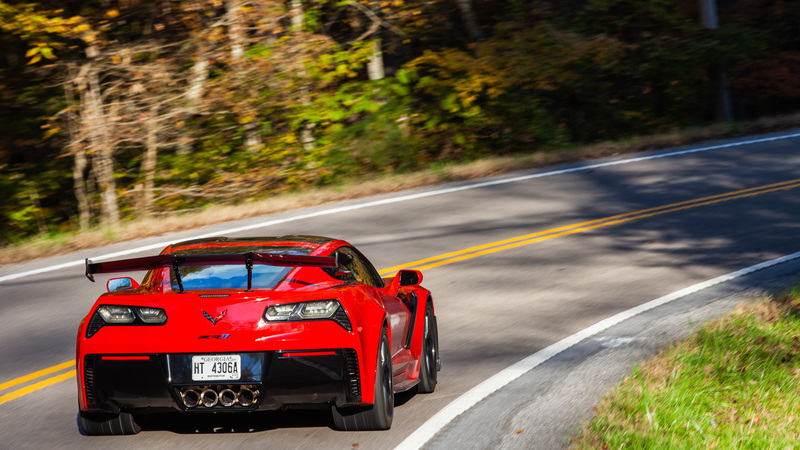 It points the front wheels into the corner with conviction and the ZR1 follows willingly. That planted feel is back as the car traces the arc the steering wheel tells it to without drama. It doesn’t want to push forward and it doesn’t beg to kick the tail out, though that’s an easy proposition with 755 horsepower straining at the rear tires. A light throttle foot is advised mid-corner. Laps captured by the car’s Performance Data Recorder show that the stability control engages on several occasions during track driving. However, in my experience, the system never cut power or intervened to bring the car back on its intended line. And that was in Sport mode. The available Track mode gives the ZR1 more rope to play with, and also firms up the steering even more. 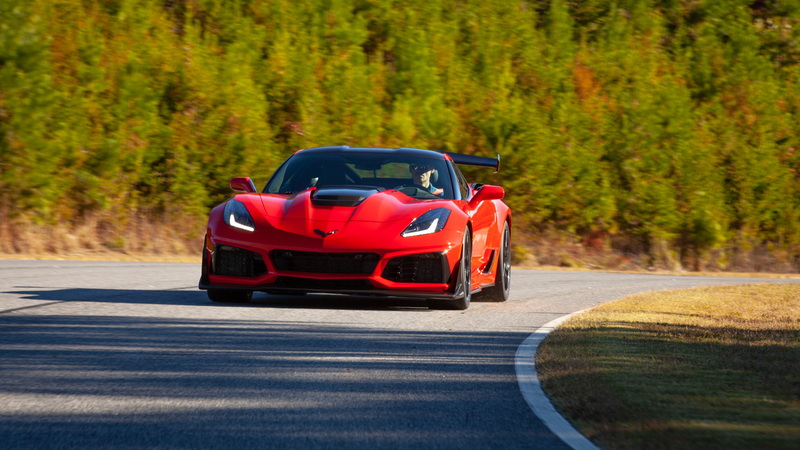 It’s the speed and stability the ZR1 exhibited at AMP that made our editorial team choose it as the Motor Authority Best Car To Buy 2019. But I haven’t even mentioned the ZR1’s biggest drawing card yet: the LT5 supercharged 6.2-liter V-8 lurking under its carbon-fiber hood. The LT5 uses a supercharger with 52 percent more displacement than the one shoving air down the piehole of the 650-hp Corvette Z06. It also adds port injection on top of direct injection to help it burn cleaner at low rpm and add power at high rpm. 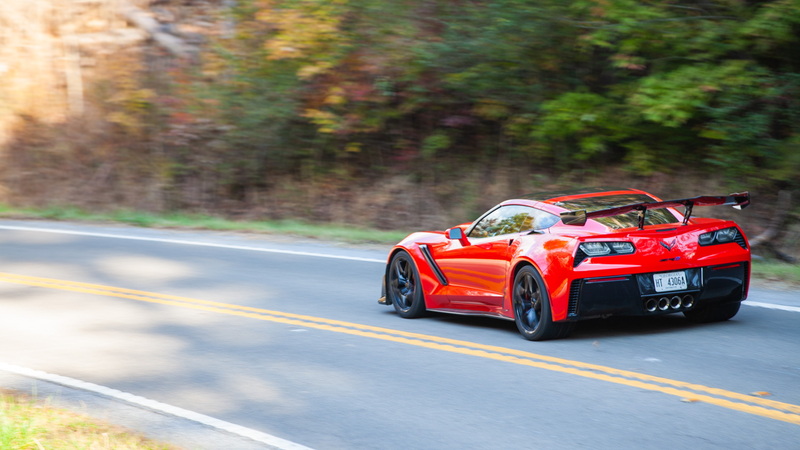 The result is 755 hp, the most ever in a Chevrolet, and 715 pound-feet of torque. It may be an old school pushrod engine, but the LT5 is a mechanical marvel—a Mecha Godzilla living under the hood. Power comes on with a rush, builds with brute force, then digs even deeper to keep pushing the ZR1 not just into triple-digit speeds but all the way to 212 mph. The other performance figures are fit for a Ferrari, Lamborghini, or McLaren: 0-60 mph is dispatched in 2.85 seconds, 0-100 mph takes just 6.0 seconds, and the quarter mile is conquered in 10.6 seconds. The LT5 does it all with a sound and fury signifying America. It rumbles with a subdued baritone when driven conservatively, but pin the throttle and the LT5 unleashes a thunderous wail straight out of “The Exorcist.” The power of Christ compels it. Our test car featured the 7-speed manual transmission. Chevrolet has made concessions to the market to sell more cars by offering an 8-speed automatic and a convertible body style, but a coupe with the manual is the purest ZR1, the best on the track, and will probably hold the most resale value. The 7-speed is a joy due to its short, positive throws, firm but not heavy clutch pedal, and natural clutch engagement. Plus, it offers rev-matching that can be turned on or off via steering wheel paddles. Skilled drivers can still heel-and-toe, and the rest of us can let the car do it. On the street, the ZR1 carries around the equipment that makes the car go like it’s possessed, and that means it attracts attention everywhere. The ZTK package’s high rear wing screams race car. The front fascia is an open maw. “There’s hardly any actual fascia there. So, we crammed it full of as many heat exchangers as we can,” Corvette Lead Engineer Tadge Juechter told Motor Authority. The ZR1 has four extra heat exchangers up front, which brings the total to 13. A taller intercooler on top of the supercharger pushes the hood scoop 3 inches higher than the one on the Z06. It reminds onlookers this car is ferociously fast, and does the same for the driver, who gets a semi-obstructed view down the center of the car. Those tires that perform so well on the track aren’t great for the street. Don’t drive the Michelin Sport Cup 2s in the rain if you want to stay on the road. They also thrum on the highway and like to follow road seams. But the street experience is mostly uneventful. In Touring mode, the steering lightens up, the magnetic dampers absorb bumps about as well as any other Corvette, and the LT5’s engine note fades mostly into the background. Inside, the ZR1 adds full leather trim, a carbon fiber steering wheel, sport seats, a performance data recorder, and a Bose sound system. It’s an improvement over the standard Corvette cabin, which isn’t bad to begin with, but Chevrolet doesn’t step the game up to six-figure levels. That’s OK, though, because the rest of the car exceeds expectations for its price, even for about $130,000 with the ZTK package. 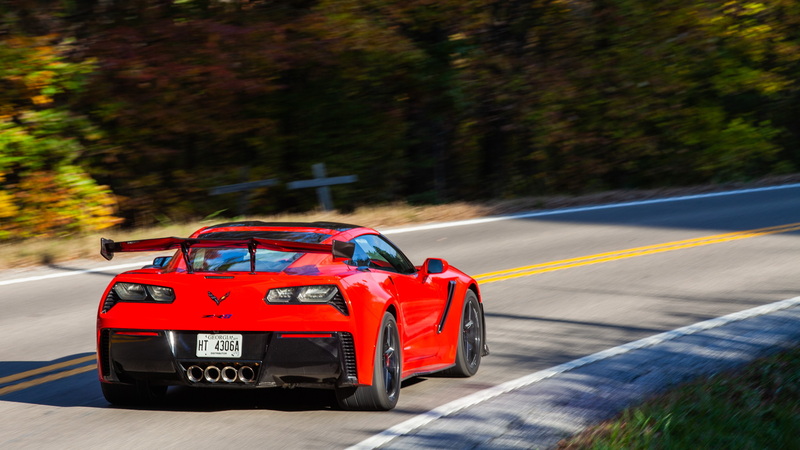 The ZR1 puts up track times that half-million-dollar exotics can’t match. It may use brute force to create its power, but the 2019 Chevrolet Corvette ZR1 is a supercar at half the price, a speed demon, and a stable genius.